I chose this book because I have just finished reading Lynda Mullaly Hunt’s Fish in a tree and it is also Dyslexia Awareness Week here in New Zealand 16-22th March 2015. Both of these books remind librarians and teachers that often, unless children are lucky enough to meet the right teacher or other adult who recognises that they are dyslexic and then get them the right reading help, then they can so easily ‘fall through the cracks’. This book is heart-wrenching, but one that will resonate with many teachers and librarians. The story is semi-autobiographical and because Patrica Polacco grew up in a different era her little self in the story is taunted with the “D word” – dumb. We don’t hear the word ‘dumb’ so often now, it’s not so politically correct, but there are plenty of other ways students can be made to feel different and the very opposite of smart. A book like this is wonderful for promoting empathy within a class and also provides a positive story for any student feeling they aren’t as smart as anyone else. The illustrations perfectly illustrate the frustration, embarrassment and shame of the young Patricia and I know many children will sadly identify with this. There are so many things we can do to help our dyslexic students and to do this we need to collaborate with teachers and learning support specialists. In the library we are trying to build our collection of dyslexia friendly titles published by Barrington Stoke and our collections of audiobooks – both on CD and digital. Most importantly we are trying to be part of the partnership between student, teacher, school and parents – with parents being an important advocate and voice for their own child. It’s all part of offering a student centric library service. We often work with children individually to help them choose books and to get their reading mileage up and this seems to work well as they aren’t influenced by their peers as they in a regular library session (there is no pressure to borrow the same books or to be made to feel ‘dumb’ when they choose easier books). I met a young year seven student and his mother in the Library last night. She had heard we had audiobooks and wanted to know more about accessing them. It was wonderful seeing how excited the boy was when I showed him our OverDrive collection. He was delighted to not only find audio editions of popular current fiction, but also to be shown how he could download then change the settings on an ebook to make it more readable (sepia toned background, lighter text colour, font choices and he could make the text as big as he liked). He could also borrow any book he liked and it’s absolutely private – no peer pressure! I also showed him how to turn on the accessibility options in the settings area of his ipad which meant he could highlight text in many apps including emails from his teacher and have them read aloud. Unfortunately they had to leave before I could also show them the collection of Barrington Stoke titles which I am pretty sure they don’t know about. 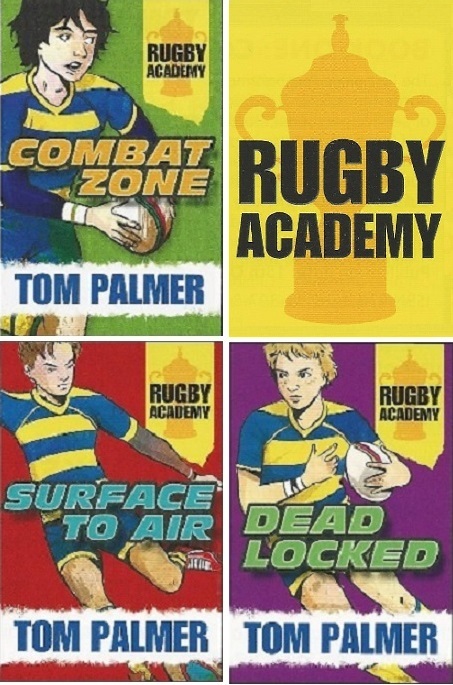 I’m going to invite both student and Mum back to show them these and get feedback on the types of titles we need more of. We will need a bigger selection of titles so that children feel they can make valid personal choices about what they read, just like their peers when choosing from the whole library collection. Both Thank you, Mr. Falker and Fish in a tree are essential school library purchases in my opinion. 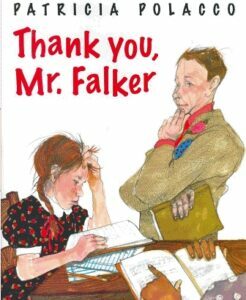 Thank you, Mr. Falker / by Patricia Polacco. Published by Nancy Paulsen Books, 2015.